What Is Greek Stifatho (Stifado)? 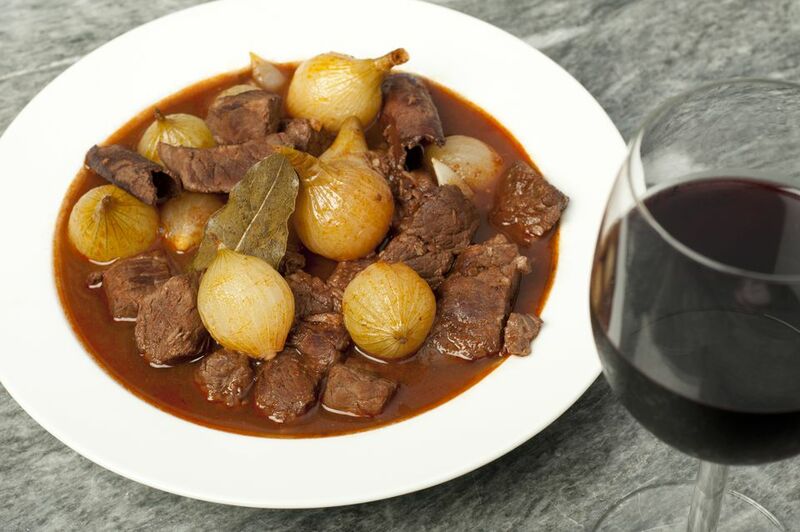 Stifatho (στιφάδο) — sometimes spelled stifado — is a Greek stew dish. The word comes from "stufado," a dish brought to Greece by the Venetians in the 13th century after the fall of Constantinople and before the Ottoman invasion. It's the Greek version of comfort food — warm, filling, and satisfying. Stifatho dishes are easy to recognize because they include onions — a lot of onions. Whole small boiler or pearl onions are the most commonly used, but larger onions can work as well. The quantity of the onions is often equal in weight to the main ingredient. Stifatho can be made with meat, poultry, seafood, game, or another vegetable as the central ingredient. Rabbit is a common Greek favorite. The onions, tomato, wine or vinegar, and a selection of spices — often including cinnamon and cloves — create a flavorful base. You can easily tailor this dish to your own preferences by adding or leaving out other ingredients with the exception of the onions. If you're onion-phobic, this dish isn't for you, but, otherwise, feel free to experiment. Older versions of stifatho don't include tomatoes because tomatoes didn't appear in Greece until after the discovery of the Americas. Stifatho dishes may also incorporate fruits, nuts and a wider variety of vegetables. Stifatho is generally made on the stovetop, but a few variations can be made in the oven. The stovetop version of stifatho is particularly easy to prepare. Brown your meat of choice in a little butter or oil in a large pot. Dump in the remaining ingredients, turn the heat to low and walk away, literally for hours. Most versions do not require that you stir periodically or otherwise fuss over the creation. If you want to go modern with your stifatho, feel free to use your slow cooker instead. Stifatho has not historically been made this way, but technology isn't without its benefits. Slow cooking will tenderize your meat even more than hours on the stovetop, but you'll want to add the onions a little later in the cooking process so they don't become too limp. Cook on high for five to seven hours, or on low for up to 11 hours. Boiler onions don't necessarily have to be painstakingly peeled before they're added. Boil them for two brief minutes, then plunge them into an ice water bath. You can cut the bottom off and the skin will slide right off with a pinch of your fingers. This is one of those dishes that gets better with age, or at least with a little age. Cook, refrigerate, and warm the stifatho up the next day. Many swear that it's even better on the second day after the flavors have had additional time to meld. Stifatho is often served with orzo, egg noodles, or thick, crusty bread.